Bombardier on April 15 revealed that its Global 7000 business jet, having completed multiple long-range flights around the world, now boasts a range of 7,700 nautical miles. The company explains this makes the Global 7000 aircraft the largest and the longest-range business jet ever built, and is able to fly a full 300 nautical miles farther than its initial commitment. Global 7000 flight test vehicles have completed several long-haul flights to destinations including Sydney, Dubai and Hawaii. The new 7,700-nautical-mile baseline range will be a feature on the Global 7000 aircraft for all existing and future customers. Just five months into testing, this high-speed aircraft set a record as the largest business jet to operate so close to the sound barrier, reaching a milestone top speed of Mach 0.995. The Global 7000 is on track to enter service during the second half of 2018. The flight test program is progressing to plan, explains the company, with all five test vehicles in flight. This program, which began in November 2016, has completed more than 1,800 hours of flight testing and is currently finalizing certification for the aircraft. Originally, the aircraft was widely publicized as being able to connect some of the world’s most expansive city pairings, including such routes as New York to Shanghai, and Singapore to Seattle. 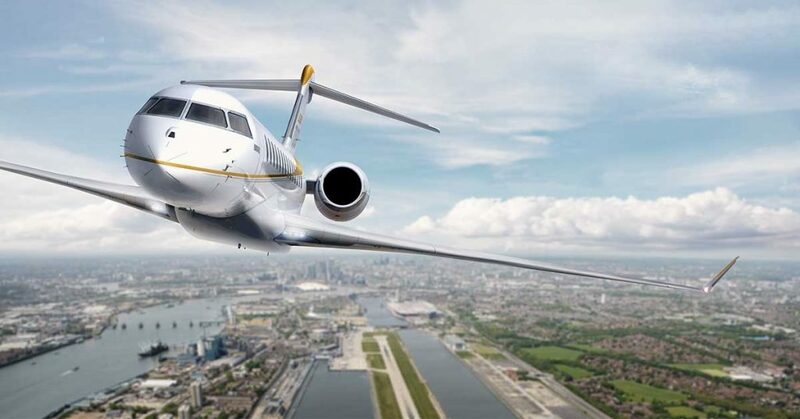 Bombardier now confirms, that with its extended range, the Global 7000, under certain operating conditions, is the only business aircraft that can connect New York to Hong Kong, and Singapore to San Francisco. Bombardier explains the Global 7000 aircraft’s advanced wing optimizes speed, range and control. Interior completions work on the Global 7000 is under way at Bombardier’s facilities in Montreal, which includes four true living spaces. It features Ka-band connection speeds. The aircraft is a 2018 Red Dot Award winner for Product Design.